Apparently, I have an alliterative annual autumn abandonment of the blog. Not much of personal interest to report. Looking out over the Hollywood Rapids on Belle Isle. 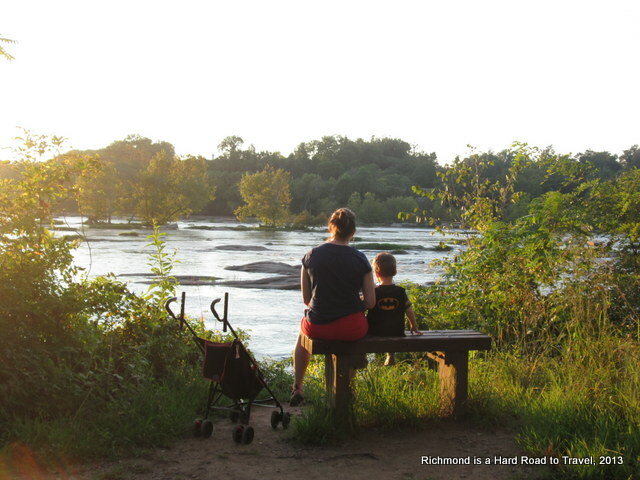 We (The Toddler and I) are trying to be good about getting out and enjoying Richmond. The past few months we’ve done the Watermelon Festival, Aviation Museum, an animal program at Maymont, Agecroft Hall, gone camping near Shenandoah, and cheered on runners at the marathon. We still do Storytime at the Library and have added weekly playdates with some friends we met there. The Husband is chugging away and has continued his pattern of his favorite subject being whatever class just ended. So this year he has wanted to be, in order, an epidemiologist (Microbiology), a nephrologist (Renal), and an endocrinologist (Endocrinology, duh). We have yet to see if he wants to become a pulmonologist, since the Repiratory test isn’t until right before Winter Break. Surprisingly, the exception to the rule has been Hemetology/Oncology. He went in to Med School pretty convinced he wanted to do Pediatric Oncology, but didn’t find that unit all that interesting. He’s at a pediatrician’s office for preceptorship now and also finds that a bit boring. He thinks that’s because it’s all well-child visits though, so he’s planning on shadowing some pediatric hospitalists over break. The Husband re-started classes on Wednesday, and since there were only 3 days of class to fall behind on, and despite our slow-to-return health, we went out this weekend. Friday night we went with friends to the Lewis Ginter Botanical Gardens to see the Gardenfest of Lights. Military Discount FTW! The Toddler enjoyed running around and staring at the Christmas lights and model trains. We also unexpectedly ran into a college acquaintance of mine who also has a toddler, so we’re going to try to meet up sometime for a playdate/catching up session. The Toddler in front of the Dragon Tunnel at Lewis Ginter. Paper crane chandelier at Lewis Ginter. Automotive garage dollhouse at Lewis Ginter. Temari (thread) balls at Lewis Ginter. Fairy castle dollhouse at Lewis Ginter. About 4 ft. tall! One model train setup had a house on fire and a fire truck to the rescue. It was our favorite. Saturday morning was our long-awaited trip to Fort Lee for the Commissary. As we drove in we passed some very nice officer housing, a golf course, fitness trail, track and nicely manicured lawns. Allegedly the Air Force stations are nicer than Army ones, so I think we’ll be pretty happy staying on base. The verdict on the Commissary is that it’s great for dog food and cleaning supplies, good for meat and frozen items, and about even for produce and dairy, with variation within the categories. Kielbasa and ground turkey were really cheap, chicken breasts were about the same as the local stores. Yogurt was half-price. If you already shop mostly generics though, it won’t save much money. Everything there was name brand. There was a great selection of produce, international, and luxury* items, so I’ll definitely be heading there again to stock up for parties. I’m glad we went, but I’ll stick with the local stores for most of my grocery shopping. I’ll probably go once a month or so to stock up on meat and dog food. As we left, we saw a platoon? (troop? brigade? About 30) of army privates sweeping the parking lot. Finally, on Sunday we met a larger group of friends at Alamo BBQ. There was a Groupon, so we decided to check it out. It was pretty good and we’ll probably go back, so Groupon accomplished? We were a little taken aback that it wasn’t really a restaurant so much as a food stand, but there was a tent and it was gorgeous out according to the people from Canada, Seattle, and New Hampshire. To the Southern Californian, not so much. He ended up borrowing my jacket. We talked about books we read over break (Abraham Verghese seemed a popular choice), about the upcoming preceptorships (15 miles away is apparently considered “close” to school) and how we all (me included!) were glad Gross Anatomy was over. That evening I met up with my gym buddy for the first time since early December. Today my pecs are sore! * Fancy cheeses, salmon, etc.